Effectively managing meeting rooms can be a ordeal. Business partners can spend valuable time running between meeting rooms trying to figure out if rooms are booked, if people are attending and when the rooms will become free. Some rooms might constantly get double-booked, which can cause issues. Other rooms may rarely get booked, staying empty most of the time or have meetings scheduled that are not attended. Valuable employee time is wasted on keeping up with paper schedules or unnavigable digital models. By using digital meeting room signs, many of these complications can be eliminated and the scheduling process for multiple meeting rooms can become seamless. Investigating the different products takes times, but there are 12 needs in digital meeting room signs that are necessary for the best experience in managing meeting rooms. Meeting room scheduling should be simple. Organizations shouldn’t have to waste time trying to schedule a meeting or hire staff to handle the conference room schedules. A digital meeting room solution should be easy to install, seamless to manage from your organizations calendar and tell everyone at a glance what is going on and where. It’s that simple, so why are so many solutions complicated? Schedule from one common calendar that everyone at the organization can access and you have eliminated most of the problems. Arreya Rooms seamlessly integrates with G Suite calendar allowing feed directly from schedules and keeping track of all rooms in one place for at-a-glance management. Arreya Rooms is a solution to meeting room management catastrophes. It meets all 12 needs in digital meeting room signs and goes beyond for a user-friendly system that can expand to any size campus. Arreya Rooms has many of the same thoughtful features found in Arreya Digital Signage Suite and because all updates are automatic, new features are constantly being added. Arreya Rooms offers a host of features that allow you to customize your signage, without sacrificing usability. The password-protected settings menu lets you change layout, background image, colors, and status messages. The room overview shows users the status of every meeting space associated with your G Suite account, so they can look for an open room. Users can check into events, and Arreya Rooms can automatically cancel any events that haven’t been checked into, freeing the room for other meetings. Since Arreya Rooms is connected to your G suite account, you can create meetings from anywhere, and they’ll appear on the meeting room signage within seconds. In case you don’t have access to a computer, you can also easily schedule a meeting right there. Arreya Rooms also includes an account dashboard, where you can manage your licenses and subscription, and check for any issues reported with any of the meeting spaces. Other meeting room signage systems are both expensive to setup and to maintain. Some systems require authorized tech teams to troubleshoot problems or fix issues. Waiting for a tech crew to fix issues can be time consuming and will usually cost for each visit. Arreya Rooms is super easy to setup, and takes almost nothing to maintain. Because Arreya Rooms is completely cloud based, troubleshooting can be done from anywhere by logging into a secure online manager. Because it is part of the Arreya family it is covered by the same great free tech support associated with Arreya Digital Signage Suite. Some meeting sign systems require dedicated staff to maintain the meeting room signage, and don’t allow automatic calendar feeds. Instead, you must cut and paste from numerous calendars into the sign system, wasting valuable work time and taking the risk of human errors in scheduling. Enable team members to collaborate together, from anywhere, in real time with G Suite resources including Google Chrome Hangouts Meet. Schedule and invite attendees, know who has accepted and add the convenient automatic cancellation feature to free up rooms quicker. No duplicate booking errors or new software to learn. 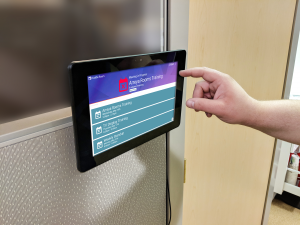 Arreya Rooms is hardware-agnostic, meaning it can be run on virtually any device with an internet browser, but the AOpen Chromebase Mini is the recommended hardware because of its hard case, commercial use, and powerful platform that allows for touchscreen interaction. You can read more about the AOpen Chromebase Mini here. ChromeOS devices can be locked down by using kiosk mode, which prevents any unauthorized users from changing what gets displayed. Additionally, ChromeOS devices can be monitored and managed through the Google Admin console, letting administrators control their devices remotely. Every Arreya Room subscription comes with an AOpen Chromebase Mini, perpetual CEM license, slim wall mount, 3 month subscription of Arreya Room and white glove setup. When you receive your Arreya Room package, all you have to do is plug it in and schedule. 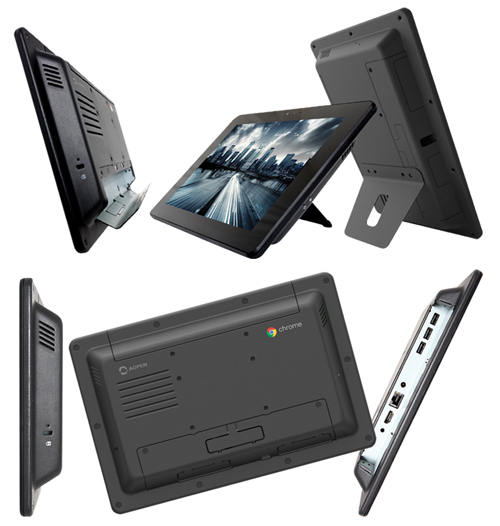 AOpen Chromebase Mini – An enterprise-ready interactive 10.1 inch all-in-one touchscreen solution. Tough and retail-hardened design for 24/7 operability in public spaces.